I'm curious to see what those script issues were. Leia's arc? Ben's? Rey's? Me too. I need to know. There were rumors KK asked Rian to come back, but I don't know if they were true or not. I got the impression he wasn't interested, also he was finishing TLJ, also he wanted this other SW trilogy and an indie project or two. Someone was saying the other day that KK wanted JJ back as long ago as 2015 and never really was into CT, sounds like a bunch of old boys Hollywood types pushed it (GL, Brad Byrd, maybe Iger?). Who knows? We did suspect CT had issues long before Carrie's passing or Thorne. No one's mentioning Book of Henry, but that seemed like the last nail in the coffin. Also, JJ collaborated with Rian when he was writing the script for TLJ, and Rian was supposed to do the same for CT. Poor Rian, and JJ was still executive producer to "continue the storytelling" in the words of KK in 2015, so had he known of and tried to fix the damage too? Yikes. - First conclusion by the most of the fans were that he obviously had struggled with the Leia story arc when Carrie passed away, but later on we heard (I think it was via Reddit) that the problems had started way much earlier with the interesting claim that Colin was incapable to come with the satisfying story for Ben Solo. Also there was a wild rumor (I don't remember from which source) about Colin insisting on re-shooting one particular scene from the already finished TLJ. So who knows if Colin's ego was the only problem in all of it - or he only had specific and concrete problems with finishing the trilogy the way LF expected from him. Oh gawd I'm seriously intrigued by what the heck went down. I'm already thinking ahead to the Blu Ray version of IX...I seriously doubt there will be an equivalent of The Director and the Jedi next time round. It definitely felt like "they'd be insane to keep him" after BoH came out and people were comparing it to The Room as in "so bad it's campy good." And I remember the eternally sensible @Piper Maru predicting that he was going to be quietly removed from that job and then later on they'd make an announcement of going their separate ways. Which did drop the day after the glowing NYT profile of Rian Johnson. Like forget about Hux resenting Kylo, can you imagine how he felt about Rian Johnson being teacher's pet? Especially because the "problems" in making TLJ were largely Mark not being happy with what was done to Luke. But he still showed up, gave a great performance, and is happy with it now. And they didn't lose their writer-director in the process! If there was a documentary, it would probably be about the trilogy's intentions, the conceiving of the Reylo love story by JJ and Kasdan, and just skip over CT to JJ, since it seems to be going smoothly now. How hard can it be to come with a satisfying story for Ben if the intention is to work on his redemption arc? Was CT not on board with that? Did the reddit comments give any details? @rawpowah There was some quote from him that he asked Rian Johnson to film something while in Ireland because it was meant to be part of the story he'd written. He had one quote about making Rey important in the galaxy, there's been speculation that maybe he was in the camp who didn't like Rey Random and wanted some 11th Hour plotline change where it turned out she was the offspring of some former prominent character. Also anybody remember the article/gossip that he wanted to keep Luke alive and have him in IX? I'm too lazy to Google it. @snufkin wrote: @rawpowah There was some quote from him that he asked Rian Johnson to film something while in Ireland because it was meant to be part of the story he'd written. He had one quote about making Rey important in the galaxy, there's been speculation that maybe he was in the camp who didn't like Rey Random and wanted some 11th Hour plotline change where it turned out she was the offspring of some former prominent character. Also anybody remember the article/gossip that he wanted to keep Luke alive and have him in IX? I'm too lazy to Google it. There were two key things Trevorrow wanted to be changed - and they were not minor. These two things have been known for a while around Disney. Firstly, he wanted Luke to still be alive in 9. He strongly disagreed with killing Luke off in 8 when he had just been re-introduced. Luke and Leia were to be a pivotal part of his script, with Leia's Force affinity revealed in a much more brother/sister way that was apparently going to be "beautiful and tragic". Mark Hamill loved it. "We were on the same page," as he's said about Trevorrow's storyline. However, Kennedy and Johnson wanted Luke dead - period. Second, he wanted Snoke to live, as his back story was to be more discussed. Fisher dying scuttled his original plan for the Leia Force affinity reveal, of course. But he still needed Luke alive for the story he wanted to tell to end the trilogy - more of a Luke handing off the baton to Rey and a Luke "walking off into the sunset" idea, in the last film - rather than Luke dying in 8. They refused. He argued. They fired him. @Moonlight13 Haha, thank you! Like I said, I'm feeling lazy today, so much appreciated. That's interesting because Kasdan and Kurtz wanted to end the OT with Luke wandering off into the sunset like a ronin samurai. Lucas overruled them because he wanted a happy ending and Kurtz quit as producer. But if that's the case, it would've undercut Rey as the protagonist for the ST . That option would've had it be about her taking on 'his legacy' (which is what the whole Rey Skywalker conspiracy theory is at the heart of it) and also undercut their antagonistic relationship. Lmfao no way he was keeping his job with THOSE demands. Seems like IX would have been a very middle of the road and forgettable movie with him at the helm. Kind of like his Jurassic Park remake. No @ Snoke living. I'd rather not focus on his backstory and focus on Ben instead. I'm sure Darth Plagueis fanboys would have loved CT lol. I have this bad feeling that CT wanted to kill off Ben and have Rey take on the Skywalker/Solo legacy, even though she's not related to them and her story is her own journey and not about their legacy. It's probably a conspiracy theory, but I would not be surprised if he wanted to make her a Kenobi or something. edit (just saw the reply): Thank you @Moonlight13 ! I don't remember it properly truth to be told. It was told by some guy who doesn't write very often there. It was just this claim without much details. That's not the same quote that @Moonlight13 has posted which was a part of an obvious anti-Rian Johnson article, also the latter reddit quote has two red flags in my opinion, because Luke lives and Snoke lives were the most prominent complaints by the certain part of the fandom. What's more Colin should have known for both things (Snoke's and Luke's death) a long time ago even before TFA came out - because Rian delivered the script with the main story points very early. If Colin was against those decisions he would have been fired much earlier IMO. There's also the possibility that Colin's writing was just not good. They hired another writer to help him well into the process after many failed attempts, after all. Also he was responsible for the JW script too. Throw in potential ego problems, what a mess. That's quite fascinating, the rumour that was mentioned earlier - about Lucas wanting CT for Episode VII. That makes me wonder if Trevorrow's conflict with LF wasn't all ego-driven, but also had something to do with loyalty to Lucas and his vision. If that were the case, I doubt CT was against Ben's redemption or planning to kill him off, or anything like that. We know from Pablo that Lucas' plans for the ST included the Solo son falling to the Dark Side. I really can't imagine Lucas' idea was to end the Skywalker saga on a bleak note, with Han and Leia's son dying unredeemed. If CT was finding it impossible to reconcile TLJ with his notion of what Lucas' Star Wars is fundamentally about, and how the OT characters should be handled, then him doing IX would never have worked, even if he were the best filmmaker in the world - which he obviously isn't. Writing around Carrie's death is hard enough, but continuing a story you disagree with to begin would have been a fundamental problem of much older extraction. Carrie's death would just have added a note of finality to the sheer impossibility of this co-operation. Whatever the ultimate cause of the conflict, I'm terribly curious why on earth LF held onto Trevorrow for so long. If the reason they finally got rid of him was simply his poor writing, then it's even more incomprehensible why they held onto him. His abilities should have been apparent from the first treatment he delivered. There were early, very early rumors (I remember only that it was winter or maybe March) that the problem is with Colin's writer. That they wanted RJ to write IX and wanted Colin to direct and then something went wrong because of Colin's writer. After watching TLJ, I'm sure that RJ left a lot of backstory details and notes which can be useful and there is a possibility that Colin&Co didn't want to use it in the beginning or ignored them for some shocking plot points. Considering that in the end they really wanted JJ for IX, I believe these rumors. I'm sure that JJ and RJ disagree on some things but JJ will certainly try to bring all Saga's movies together and I doubt that Colin can actually understand how it works. @Darth Dingbat Wasn't there another rumor that Colin was only kept for so long because he was a seat-warmer for JJ, who was trying to get out of the exclusive movie co-production deal his Bad Robot has with Paramount? It was already a big deal that he was able to get that deal for TFA. @californiagirl wrote: @Darth Dingbat Wasn't there another rumor that Colin was only kept for so long because he was a seat-warmer for JJ, who was trying to get out of the exclusive movie co-production deal his Bad Robot has with Paramount? It was already a big deal that he was able to get that deal for TFA. I think that's just unconfirmed speculation, but it does make a lot of sense. The timing of all of this is interesting...because according to Wampler, Trevorrow was known to have been sacked as early as June 2017 (if not possibly earlier). Jack Thorne (the Cursed Child guy) was announced to have been brought in to "re-tool" Colin's script on August 1. Colin's firing was announced in early September... So if Colin was already out, I kinda wonder what they were doing with Thorne. Right. That article indicated that could have been as early in April 2017 or maybe even a bit before, because Colin was already starting to sound negative. Also, Wampler may have sat on it for a while before he gave that hint. As for Thorne, that whole situation was weird, because Thorne would never be a director for SW. Was KK trying to get Thorne to work some magic like she tried with Michael Arndt? Or were KK and JJ, (who maybe was already secretly signed as director), testing out Thorne, but then ended up going with Terrio? How in the world did that statement about Lucas come into existence? It’s exhaustively documented that after SNG did well at Sundance’s 2012 festival is when Brad Bird’s whole “he reminds me of me” went down & he got invited to shadow him on Tommorowland’s production. KK’s first choice to direct TFA was Bird and that’s when he tried to convince her to have Trevorrow babysit pre-production for TFA because Tomorrowland was his passion project. Which led instead to JJ getting hired and Trevorrow getting handed JW. Sorry @snufkin, I assumed IGN was a trustworthy source so that's why I went on with that speculation. I also have a bad habit of typing whilst sleepy from insomnia, so I may have misunderstood things anyway. If they really have Mike Zeroh levels of credibility, yikes. Please ignore what I said. @Darth Dingbat And I have a bad habit of posting during migraine attacks and being extra cranky, so no worries. Slightly off tangent here. 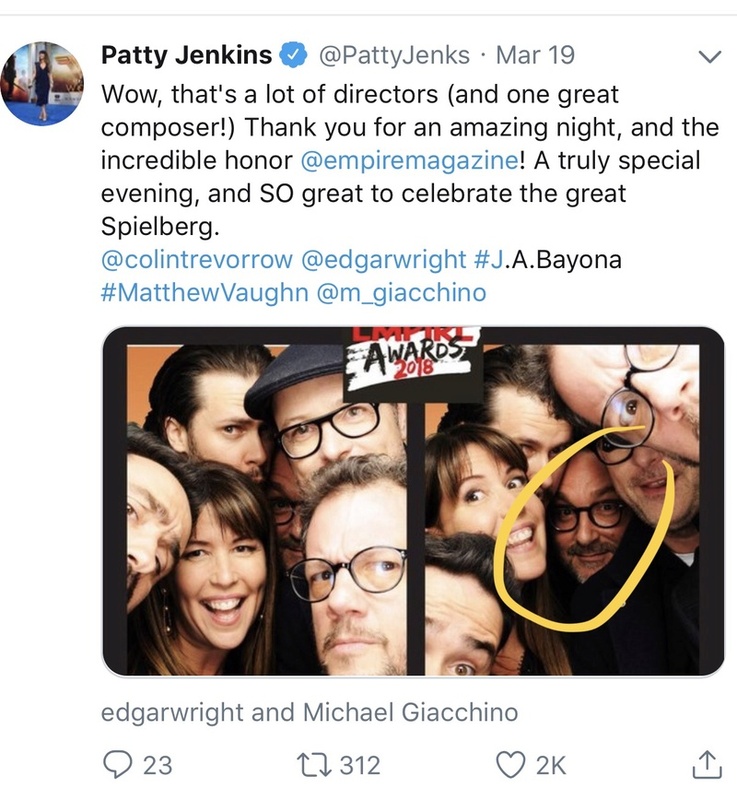 With all this talk of Trevorrow I remembered a pic the Patty Jenkins posted a pic on Twitter from the Empire Awards last month. I was pretty surprised to see Colin in the background. I wondered at the time if there was any backstage awkwardness between him and the Last Jedi crew or if it was just water in the bridge now ? @snufkin wrote: @SheLitAFire Um, first of all LMAO Phantom Thread icon! Wait... why "lmao" at my Phantom Thead avatar? @SheLitAFire As somebody who never has SW related icons, I salute you! @snufkin wrote: @SheLitAFire As somebody who never has SW related icons, I salute you! Oh, thanks I just love the cinematography and am also obsessed with the movie now. Vicky Krieps is so graceful and elegant!